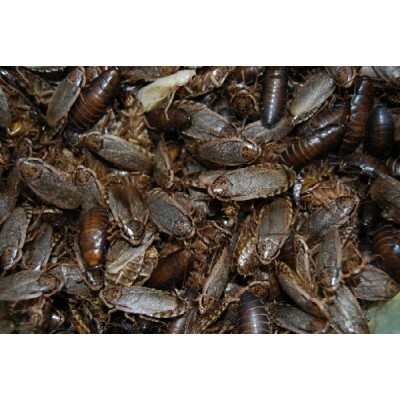 Livefoods Unlimited currently produces three main insect species in bulk quantities, the brown house cricket (Acheta domestica), the wood or Madeira cockroach (Nauphoeta cinerea), and the giant mealworm (Zophobas morio). All insects are available by mail order all year round. They are raised on high quality certified organic grain-based foods supplied by Aus Organic Foods supplemented with fresh vegetables on a daily basis. 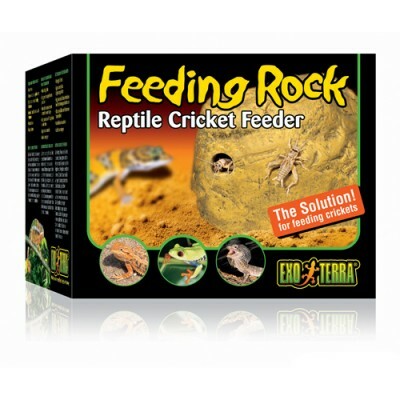 This diet ensures that there will be no residual pesticide or other chemicals acquired by the insects during feeding that may accumulate and could potentially be passed on to your precious animals. Each insect group is raised in a separate species-specific facility where temperature, humidity, ventilation, etc. are all monitored and controlled precisely to ensure the maintenance of a healthy, productive colony all year round. This, combined with the quality of the diet, guarantees that Livefoods Unlimited insects are of an exceptionally high standard when they leave our establishment, reflected in their vigor and longevity on arrival. All shipments are sent by methods designed to minimize transport time and stress and ensure your live insects arrive in good order. Specially manufactured vented cardboard boxes or ventilated cardboard tubes are used for all shipments, with larger bulk orders being firstly packed in free-breathing calico bags. All insect orders are measured by weight with an additional 10% added to compensate for any minor losses which sometimes occur in transit to ensure customers always receive at least their ordered quantity. All insects are packed with cardboard rolls, egg cartons or shredded paper for protection during transit plus sufficient fresh vegetables and dry food to last a 3-4 day journey if necessary. In the majority of cases, mail order insects are received the day after dispatch; however, Western Australian, Northern Territory and some regional orders from other states may take two (2) days. All our insect species are very robust and resilient and this time frame has no deleterious effects provided the shipments are handled appropriately during transit. The main issue affecting the well-being of the insects during shipping is heat and all packages are labeled to highlight this to transport companies. Occasionally shipments are left in the sun or next to a heat source for too long to the detriment of the insects inside though this has only happened a handful of times since our operation began and our guarantee means that such losses would be replaced free of charge.